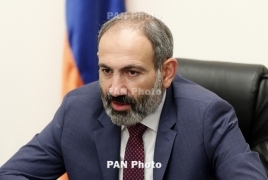 PanARMENIAN.Net - No decision has been reached on the price of Russian gas for Armenia, acting Prime Minister Nikol Pashinyan said on Facebook after a visit to Moscow and a meeting with Russian President Vladimir Putin. "Discussions around gas prices will continue. Of course, the issue is an overly sensitive topic for bilateral relations, and both governments realize this," Pashinyan said. The acting PM added, however, that he is generally optimistic about the matter. "I hope the issue will have a desirable ending, or at leas not an undesirable one for us," he said. Earlier, acting Minister of Energy Infrastructures and Natural Resources Garegin Baghramyan revealed that Armenia is negotiating a lower gas price with Gazprom and Russia’s Energy Ministry.